WARNING : This is a J-KIT (Junction-Kit) brake version : brake comes with lever unconnected to the hose, that allow to fix more easily the brake on a frame with hose routing integrated and it makes it easier to shorten hose to the correct length on your bike. However, the brake is already bleeded. Cut the hose at the good length with an appropriate tool and insert a brand new insert (pin) into if its needed. Tight the nut to crimp the connection already fixed into the lever, on the hose. Now, you can push the lever to finalized fixing. Supplied with conventional brake pads. Weight checked Alltricks: 583 gr Front brake only with brake pads, discless. Supplied with 4 caliper bolts, connection kit. 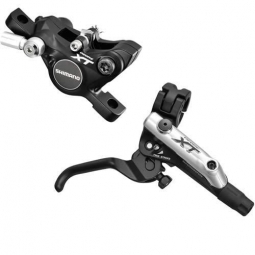 SHIMANO Frein Avant XT M785 Noir J-Kit Prêt à Connecter Sans Disque PM clasificado 4.8 de 5 por 88.